As opposed to what, you say. A possum? Why yes, a possum knows very little about wearing a sweater. 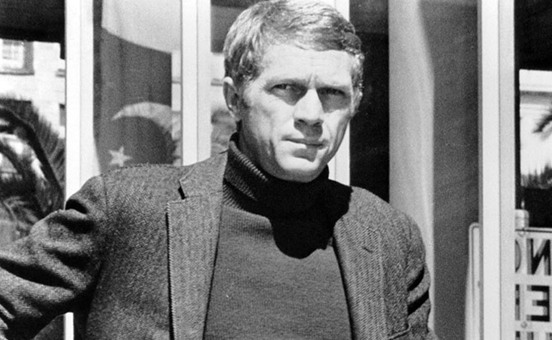 Steve McQueen, on the other hand, may not have known the latest trends; but he did know himself. That was all he needed to carry off just about everything he pulled over his head, from the simple, chunky, sometimes light, and most often very neutral-colored sweater. 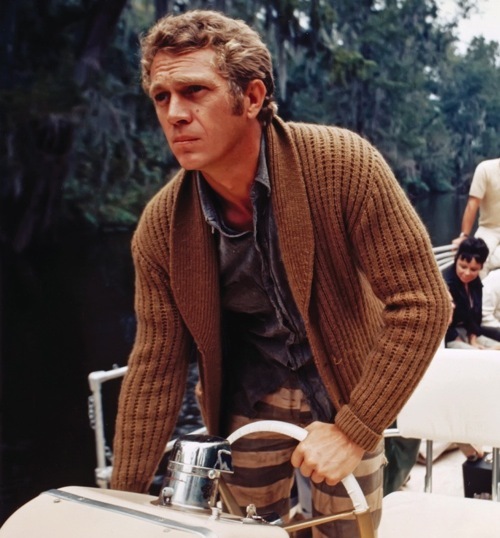 Steve McQueen cared little about fashion or trends, but he was all about style, and that will always be a portion of the legacy he has left behind. The clothes have never made the man… it is the man’s job is to carry himself well, so that his clothes will take on a role of their own. 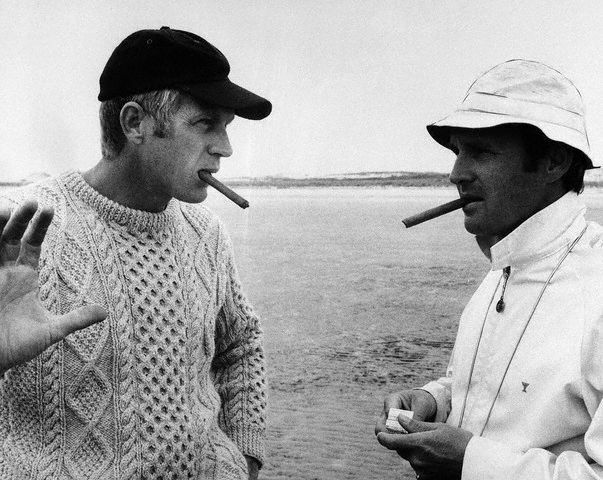 A role that says I am confident, rugged, straight-forward, no fuss-no muss, laid back, and most of all–I am a man who could smoke a cigar with Steve McQueen, and then share a glass of wine with Elizabeth Taylor, and not even question the fact of whether I’m worthy. 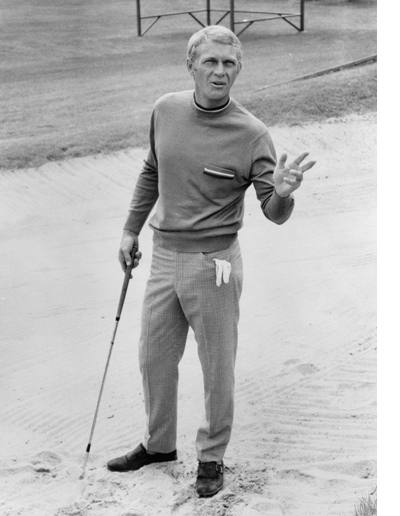 And rather than bore you with texture and color charts; here are some classic pictorials on how to wear a sweater like a man. 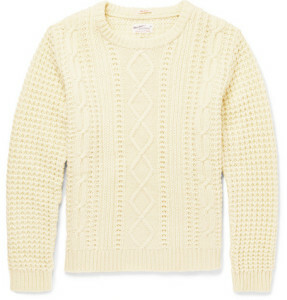 The Gant Rugger Cable Knit Sweater is chunky and neutral colored. Within each heavy layer of wool, resides a deeper mystery behind its wearer. It takes many years to build up many layers of complex and interesting character within your personality. However, it only takes one sweater to offer that complexity in a single glance. 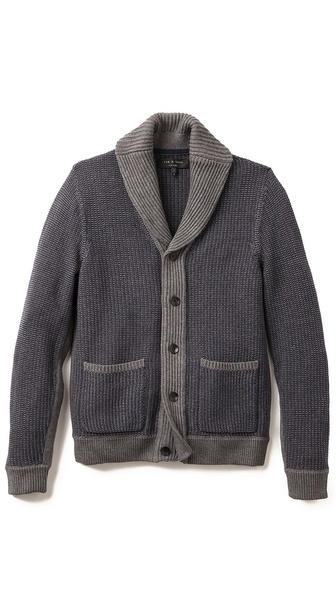 The Rag & Bone cardigan is chunky in much the same way of the cable knit sweater, but offers the laid back nature of a loose, shawl collared cardigan. This gives a man plenty of options in the layering department. Either dressed up or down, the contrasting trim will give you an extra level of complexity–not that you need it. 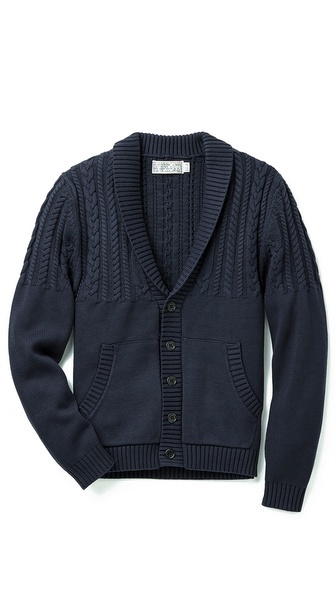 Shipley & Halmos offers a slightly more rugged textured cardigan in a deep navy blue. Its ornate knitting and ribbed hem and cuffs were designed to wake up a simple collared shirt, or tone down a very bright one. But if you’re Steve McQueen, you won’t need bright colors to stand out, as the way you carry yourself will be all the limelight one room can handle. 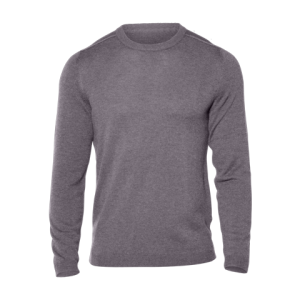 The Ministry of Supply Crew Neck Sweater offers sophistication in a light, high performance fiber, called Merino wool. 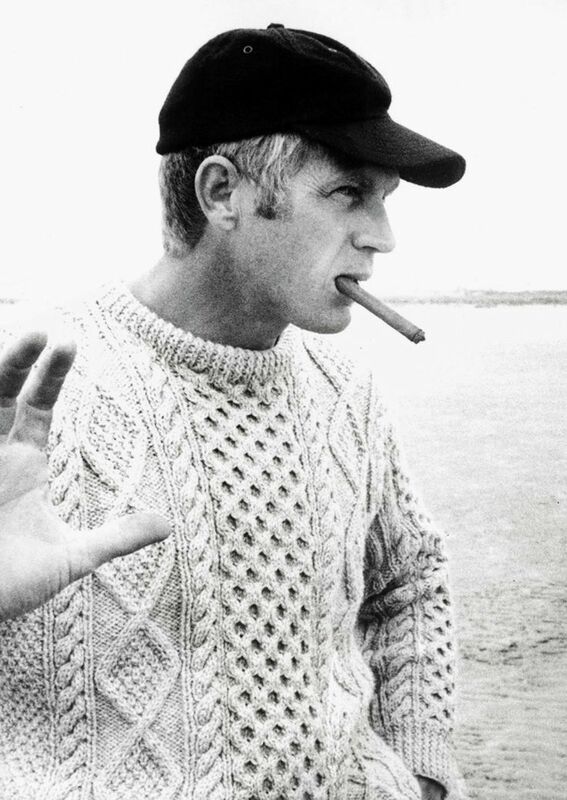 While McQueen never had the opportunity to wear a high tech sweater like this, he would of most certainly approved of it. Behind its classic stylish looks is the same ‘Phase Change’ material found in spacesuits, which allows the body to do its job of regulating your temperature. In other words, it will keep you warm during the warm-up phase of your first few holes, and then allow you to cool down as the stakes (between friends) get a little heated. 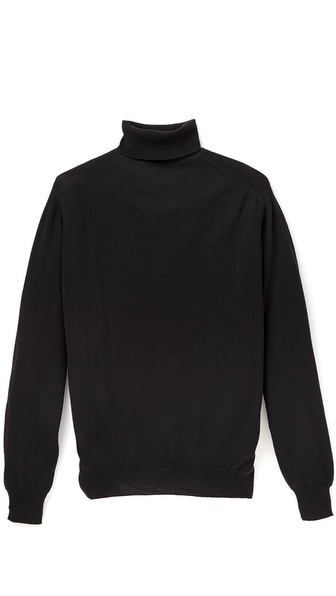 An entire book could be written on the importance of the turtleneck sweater to a man. However, rather than be filled with words, it would have images such as the one above, demonstrating its many veils of flexibility. 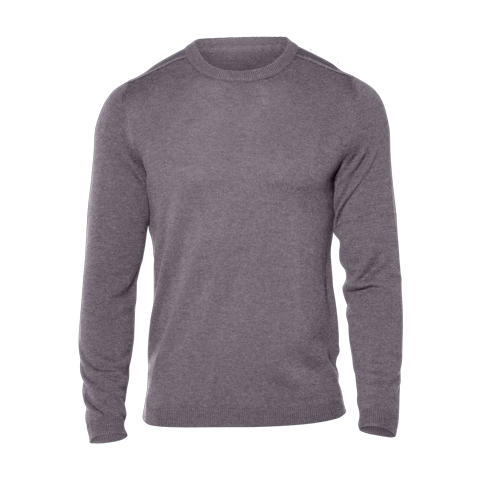 This roll neck turtleneck by Mr. Start is light and slim fit, but with just enough thickness and texture to give it some dimension. Whether you choose to wear it alone or underneath a jacket (as above), it doesn’t really matter. This one happens to be Scottish-made and 100 percent wool–enough said.